Today's Daily Deal! 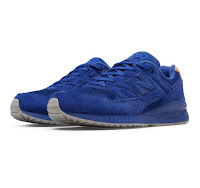 Save 72% on the Men's Lifestyle 530 Now Only $30.00 + $1 Shipping with code DOLLARSHIP at JoesNewBalanceOutlet.com! Offer valid Monday, 1/23. We’ve opened the vault to bring back our men’s 530. An original ‘90s running design, it was one of New Balance’s first shoes to boast synthetic materials  and it’s still influencing running styles today. With the original silhouette and ENCAP® technology, the 530 mixes bold mesh and lightweight synthetic materials for an old-school look. We crafted our first pair of shoes over 75 years ago. And while we have a long, rich history of performance and innovation, we’re proud to look back at styles that helped us earn the reputation we have today.